May 1997 in CCM "The New Holy Order: Honorable Mention"
Apr 2011 in Charisma "Behind The Worship: A 'Friend of God'"
Jul 2013 in Charisma "Excellence & Worship: My Royal Obsession"
2010: Love God. Love People. Contemporary Gospel Recorded Song: "There's a Liftin' of the Hands"
Urban Recorded Song: "Get Up"
Contemporary Gospel Recorded Song: "Again I Say Rejoice"
Contemporary Gospel Recorded Song: "Not Forgotten"
Contemporary Gospel Recorded Song: "Turn It Around"
Contemporary Gospel Recorded Song: "Say So"
Contemporary Gospel Recorded Song: "The Power of One (Change The World)"
Contemporary Gospel Recorded Song: "Every Prayer"
Urban Recorded Song: "Just Wanna Say"
Contemporary Gospel Album: Love God. Love People. Contemporary Gospel Recorded Song: "You Hold My World"
Traditional Gospel Recorded Song: "It's Not Over (When God Is In It)"
Gospel Performance: "It's Not Over (When God Is In It)"
Contemporary Gospel/Urban Recorded Song: "Sunday Kind Of Love"
Traditional Gospel Recorded Song: "How Awesome Is Our God (ft. Yolanda Adams)"
Best Gospel Song: "Again I Say Rejoice"
Best Gospel Performance: "Not Forgotten"
Best Gospel Song: "Not Forgotten"
Best Gospel Performance: "With Long Life"
Best Gospel Song: "Every Prayer"
Best Gospel Performance: "You Hold My World"
Best Pop/Contemporary Gospel Album: Love God. Love People. 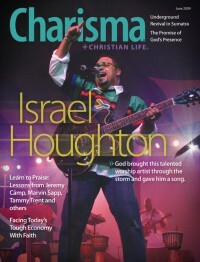 Best Contemporary Christian Music Song: "Your Presence Is Heaven"
Best Gospel Performance/Song: "How Awesome Is Our God"
1 article credited in CCM: 2005.